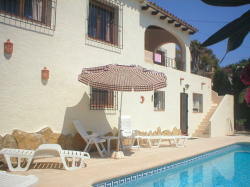 This charming villa is set in an elevated position only 2 kms from the Moraira/Calpe coast road. One hours drive from Alicante or one hour 15 mins from Valencia Airport and only 5 mins from the lovely town of Moraira and 10mins from Calpe. Casa Suenos has open valley views from the Naya and the landscaped gardens contain mainy tropical plants, the largest of which provide some shade around the south facing secluded pool area. The unusual trapeeze shaped pool is 8x4m with outdoor shower and roman steps along the entire width of the shallow end. There are plenty of sunloungers and seats to relax on around the pool terrace, ideal for al fresco dinning after making use of the large BBQ. Casa Suenos has been recently refurnished with stylish, modern but comfortable furniture. The accomodation consists of 3 double bedrooms all with fitted wardrobes, 2 with double beds one en-suite and one with twin beds plus a family shower room all situated on the uper level of the property. This area also has a living/dining room with woodburner and fully equipped kitchen. At pool level there is a self contained apartment recently refurbished, consisting of a living area, kitchen, bedroom and bathroom.Ideal for large familes or 2 families holidaying together,the villa and apartment would only ever be rented to the same party keeping it private.